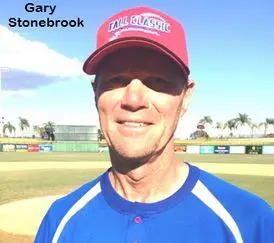 November 18, 2017, Clearwater, FL – After travelling more than 2,900 miles to participate in the Fall Classic, Sacramento Royals manager Gary Stonebrook joked that he wasn’t looking forward to the cold weather that awaited him and his teammates back home. Another Fall Classic championship should help make the trip a bit more comfortable. In a dominating display, Sacramento scored 11 runs on 20 hits and Stonebrook held Montgomery County hitters to just four hits and a pair of runs as the Royals captured their first Fall Classic title since 2007. “We always bring a small squad, because everyone wants to play,” Stonebrook said. “And we have really good pitching, so we usually have great records here. That seems to be the key for us.” That and a line-up that boasts talent throughout the order. Sacramento erased an early 1-0 deficit by scoring two runs in the third, three in the fourth, four in the fifth and two more in the sixth to cruise to the title. The blowout victory capped a 7-1 week, in which they scored in double digits in their final three games. To reach the championship tilt, the Royals dispatched the Mustang A’s 11-7 and Andreas Yankees 12-8 in typical Sacramento fashion. Looking back, with a dominant offense all tournament and Stonebrook’s effective pitching, maybe the blowout victory should have been expected all along. Stonebrook said his team’s home Sacramento league is tops in winning championships with “two or three per year” and that the difficult competition they face during the regular season more than prepares them for tournament play. Against Montgomery County, which also finished 4-1 in round-robin play before playoff victories over the Naperville Yankees (9-4) and Cleveland Steve’s Sports (5-2), the Royals found themselves in a surprisingly familiar place – trailing. Mike Ickes reached via an infield error, stole second, reached third on another infield error and scored on a 4-6-3 double play for a 1-0, second-inning lead. In the playoffs, Sacrament found itself behind by three runs before rallying to defeat the Mustang A’s. A similar pattern would emerge in the championship game. With Montgomery County’s pitching diminished by a week of play and facing the same Jeff Budin who tossed a complete game playoff gem the previous day, Royals players figured it was only a matter of time before their offense took over again. A half-inning after falling behind, Sacramento grabbed the lead for good. Terri Callahan opened the third with a single to left and one out later, went to second on Ken Jungston’s single to right. A misplayed sacrifice bunt loaded the bases, before Derrick Rebensdorf and Dave Absher plated a pair of runs on a sacrifice fly out and a bloop single down the right field line, respectively. Four hits, including run-scoring singles from Callahan and Jungston pushed the lead to 5-1 in the fourth, before Sacramento put the game out of reach in the fifth. The Royals exploded for four runs on seven hits, including tournament MVP John Daly’s back-breaking, bases-clearing double to right-center. Daly capped an outstanding tournament by going 3-for-5 with two runs scored and three RBI in the final. Despite hitting eighth and 10thin the order, Callahan and Jungston helped pace the offense by combining for five hits, three runs scored and three RBI. Steve Welch was even better, collecting four hits and scoring three times. Instead, the Royals were held to just one more hit. By then however, it didn’t matter as Sacramento had already sewn up the title. The Yankees did manage one final run, coming when Tony D’Aulerio’s double drove home Gary Carmon from first in the bottom of the sixth inning. While Montgomery County manager Mark Greenspan said he was proud of his team’s effort, he knew it faced a difficult challenge from the first pitch. WP: Stonebrook. LP: Budin. Pitching: Stonebrook and Welch (SAC). Budin, Toth and Vasas (MC). 2B: Daly (SAC). D’Aulerio (MC).